Cook Noodles per package directions; drain and rinse with warm water. Wash and dry the Vegetables; slice the Zucchini and Yellow Squash vertically into 4 lengths and slice again into 3/8” pieces. Peel the Eggplant and then slice into 1/2” slices. Mince the Basil and Garlic and mix with the Olive Oil and Salt. Place the Squash and Eggplant in a shallow bowl and combine with the Basil mixture. Heat a stovetop grill; when it is hot, grill the marinated vegetables just until light brown grill marks appear on them. Remove to a platter. Clean the Mushrooms and remove the stems; slice crosswise into 1/4” slices. Heat the Oil and Butter in a medium saucepan; when it is hot add the sliced Mushrooms and sauté them until they begin to caramelize. Add the Flour; stir and cook until the flour and fat combines and begins to thicken. Slowly add the Cream and cook and stir until the mixture thickens; add the Pepper and stir again. Set aside. Dice the Tomatoes and place in a sauté pan; cook over high heat for 10 minutes and then add the Wine; continue cooking until most of the liquid is reduced. Stir in the Tomato Paste. 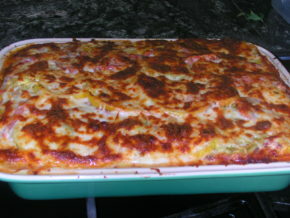 Lightly oil a lasagna pan; arrange a layer of cooked pasta vertically; spread about ¼ of the Bechamel Sauce over the Pasta; sprinkle with the dried Oregano and Parmesan. 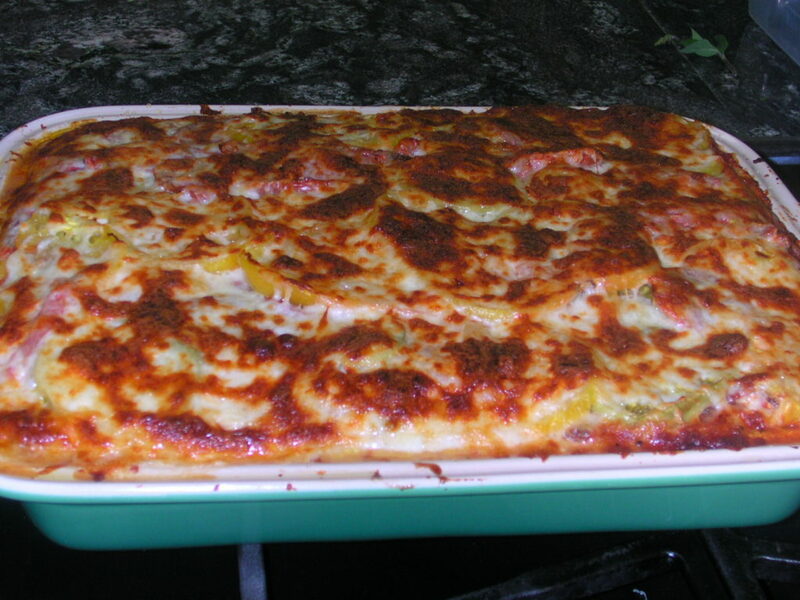 Scatter about ¼ of the cooked vegetables over the pasta; scatter about ¼ of the Mozzarella over the vegetables. Next, arrange a layer of Pasta crosswise and continue adding the Bechamel, Parmesan, and Vegetables and Mozzarella. On the last layer add the cooked Tomatoes before adding the Mozzarella. Bake in a 350 degree oven for 30 minutes or until the top layer of cheese starts to bubble and turn golden brown.